Computer Music's resident sound designer, and Modular Synth abuser Scot Solida, gets the horn for powerful, punchy and entirely synthetic brass sounds. 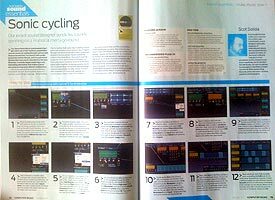 All in his Synth Essentials column in the Computer Music, January 2012 issue. Christmas comes early this year! In the dark and cold season, what better than to sit by your warm computer and make some delightful synthesizer ear-candy using a powerful modular machine? As last year, KarmaFX wants to celebrate the holiday season by having a 35% off sale on KarmaFX Synth Modular! If you have been wanting to break out of the fixed-path-synthesizer cage, and plunge into modular awesomeness to take full control over your soundscapes, now is your chance! For a limited time only. KarmaFX Synth Modular has a unique sound due to the high quality of the built-in modules and the internal high frequency, sample accurate modulation. Roll your own sounds by connecting modules in creative ways, or simply use some of the many quality, pre-made patches. Sale starts today, december 5th! KarmaFX wishes everyone a merry X-mas, a happy holiday and a magical new year 2012! EDIT: Sale extended 5 more days! Now ends 10th of january!! KarmaFX Synth Modular v1.16 released. Update contains bugfixes. KarmaFX Synth Modular 1.16 changelog. Bugfix: Samplerate in Audio Unit would not work with anything but 44.1kHz. Fixed. Bugfix: Audio Unit upgraded to latest SDK. Now requires minimum OS X 10.6. Bugfix: Synth and FX Audio Units had exposed gui interfaces with the same class name. Fixed. Computer Music's resident sound designer, Scot Solida, goes crazy with the step module in KarmaFX Synth Modular to do wavesequencing. 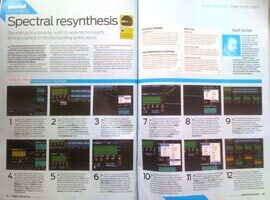 All in his Synth Essentials column in the Computer Music, October 2011 issue. 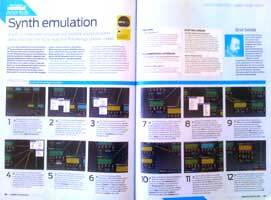 Computer Music's resident sound designer, Scot Solida, uses KarmaFX Synth Modular to play with spectral resynthesis in his Synth Essentials column in the Computer Music, August 2011 issue. To celebrate the sunny warm weather, the barbecue, the hot sand and the shallow, salty waves on the beach, KarmaFX will be having a summer sale this year! This means that the price of KarmaFX Synth Modular will be cut 35% during the summer!!! That's right! So if you're serious about synthesis, and want to take the plunge into modular sound creation or just spice up your music with some killer modular patches, now is your chance to do so at a reduced price, and for a limited time only, starting now!! Simply click here to buy and have fun during those long, warm summer evenings! EDIT: 09/05/2011: Summer Sale has ended. Computer Music's resident sound designer, Scot Solida, turns frequency modulation on its head by pursuing this typically digital technique using a modular "analogue" synth. 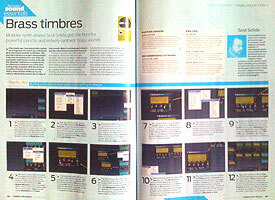 All in his Synth Essentials column in the Computer Music, June 2011 issue. Two new exclusive tracks from Wavetraxx: One of the leading hardtrance producers! First track is called: Meriton Celiku - Love7 (Wavetraxx Remix) and has not been released or published yet. 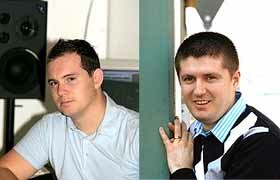 Done by Christoph Menzi/Wavetraxx (left) and Meriton Celiku (right). Leadsound was created with Sylenth1, KarmaFX Synth and Virus Powercore! Second track fresh from the studio is Wavetraxx Nightingale. 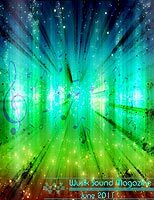 KarmaFX Synth was used for some background soundelements and for the lead on this awesome sounding track. Thanks so much Wavetraxx! Keep it up! 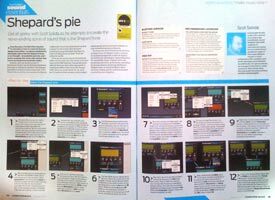 Computer Music's resident sound designer, Scot Solida, demonstrates how to create the shepard tone, a sound that creates an illusion of continuosly ascending or descending pitch, All in his Synth Essentials column in the Computer Music, January 2011 issue, this time using the Mac / OS X version of the synth. KarmaFX wants to celebrate this years holiday season by having a 35% off sale on KarmaFX Synth Modular! So if you've been wanting to get into modular synthesis, now is your chance to do so at a reduced-price! For a limited time only! KarmaFX Synth Modular has a unique sound due to the high quality of the built-in modules and the internal high frequency, sample accurate modulation. Roll your own sounds by connecting modules in creative ways, or simply use some of the many quality, pre-made patches. Sale starts today, december 24! Last day is friday, 14th of january. Click here to buy. KarmaFX wishes everyone a great holiday and a happy new year! 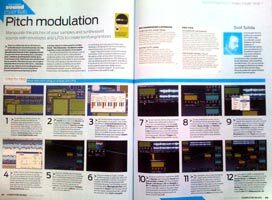 Computer Music's resident sound designer, Scot Solida, experiments with pitch envelope modulation to produce terrifying timbres in his Synth Essentials column in the Computer Music, December 2010 issue. 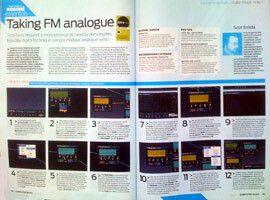 Computer Music's resident sound designer, Scot Solida, demonstrates how to recreate the Polymoog's unique sound using KarmaFX Synth Modular in his Synth Essentials column in the Computer Music, Autumn 2010 issue. 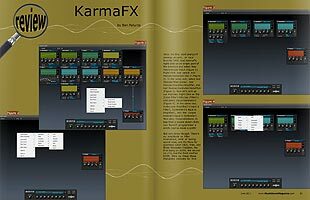 The KarmaFX Synth Modular v1.15 build 6024 for Windows fixes an important issue in Cubase SX 3.1.x. Users having this issue should download installer again, and reinstall. KarmaFX Synth Modular 1.15 build 6024 changelog. KarmaFX Synth Modular 1.15 released for PC and Mac!! KarmaFX Synth Modular 1.15 has been released. See full changelog below. Now, for the first time, KarmaFX Synth is also available for the Mac / OS X (Intel) / Audio Unit platform!! Full install is required. Registered users should have received a notification e-mail and can update online by using the download link or by using "Check for Update Now..." inside the synth. A PC & Mac Bundle is available with the same discount, for non-registered users that want both versions. KarmaFX Synth Modular 1.15 changelog. 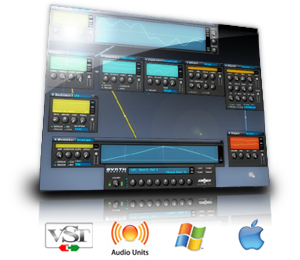 Synth reverted to use the VST 2.3 interface with the 2.4 SDK under Windows. Bugfix: Synth now handles bogus host tempos gracefully. Bugfix: Mouse right button double click was not mapped on Mac. Fixed. Demo version expires February, 2011. Mac OS X Release Candidate Demo now available! The KarmaFX Synth Modular v1.14 Mac OS X (Intel) release candidate Demo (Build 6016) is now available for download on the Products page. Thanks to all the beta testers and special thanks to Jan for help with the Mac porting process! If all goes well the release version will be ready for purchase within a week or two. KarmaFX Synth Modular 1.14 has been released. See full changelog below. Full install is not required. Registered users should have received a notification e-mail and can update online by using the download link or by using "Check for Update Now..." inside the synth. KarmaFX Synth Modular 1.14 changelog. Bugfix: Added missing support for the "key" keyword in .sfz loader. Bugfix: Better .sfz loader error checking. Bugfix: 31 band equalizer 12/24dB toggle did not show up in GUI correctly. Fixed. Australian alternative electro producer Euphemiser (alias Adrian James) had his first live performance this September at the Brisbane Hotel, Hobart. Euphemiser uses KarmaFX for 99% of his synth needs. "I use three to six different custom-made patches for each track, and sometimes run the live vocals through KarmaFX too...KarmaFX is as versatile as it is powerful, and so easy to use. You're pretty much just limited by CPU and your imagination." 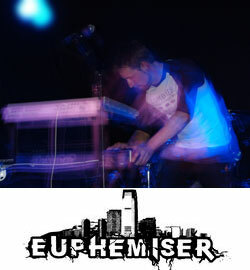 Euphemiser uses Ableton Live 8 as DAW/host, and KarmaFX Synth both to produce backing tracks and to play live on midi keyboards. Euphemiser's next gig is at Alley Cat on the 5th of November. Check out his music on myspace and last.fm! KarmaFX Synth Modular 1.13 has been released. See full changelog below. Full install is not required. KarmaFX Synth Modular 1.13 changelog. Bugfix: Changed the way the NotePitch module handles all-notes-off midi events. Feedback connections are now always made with an initial volume of 0. Added a "license days remaining" popup window to the demo version. KarmaFX Synth Modular 1.12 has been released. Unfortunately v1.11 had a couple of serious bugs. These have been fixed in v1.12. Updating is highly recommended. A fresh install is required. See full changelog below. Registered users should have received a notification e-mail and can update online by using their download link. Apologies to everyone who updated to v1.11! KarmaFX Synth Modular 1.12 changelog. Bugfix: Small memory leak in ini file reader. Fixed. Bugfix: Online update would crash in v1.11. Fixed. Bugfix: Fixes for uninitialized memory. Bugfix: Simplex mode toggle did not always work. Fixed.